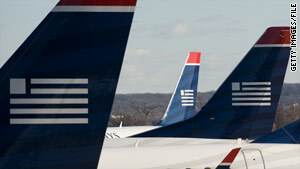 US Airways said "two pilots, five flight attendants and two passengers are seeking medical attention as a precaution." (CNN) -- Nine people were taken to a hospital Tuesday after complaining of a foul odor aboard a US Airways flight in Charlotte, North Carolina, according to the airline. US Airways Flight 985 was bound for Montego Bay, Jamaica, the airline said. It had pushed back from the gate and was taxiing on the ramp when an electrical smell was reported in the cabin, Federal Aviation Administration spokeswoman Kathleen Bergen said. Paramedics were called, and "two pilots, five flight attendants and two passengers are seeking medical attention as a precaution," US Airways spokeswoman Michelle Mohr said. The remaining passengers were set to depart on a later flight Tuesday on a different aircraft with a new crew, she said. Those affected were complaining about symptoms consistent with exposure to toxic fumes, according to Medic, an emergency medical service whose paramedic teams responded to the incident. Charlotte Medical Center confirmed that nine patients from the plane arrived and were doing fine, but officials said they could not comment specifically on any of their symptoms.